For the first time ever, I celebrated my birthday a few weeks ago in a foreign country. I was feeling a bit nervous because I was far away from home, family, and friends–I had arrived in London only two days before, and both days had been packed with touristy (and wonderful!) but tiring activities, including a day-early birthday surprise of 4 o’clock tea-and-champagne time. 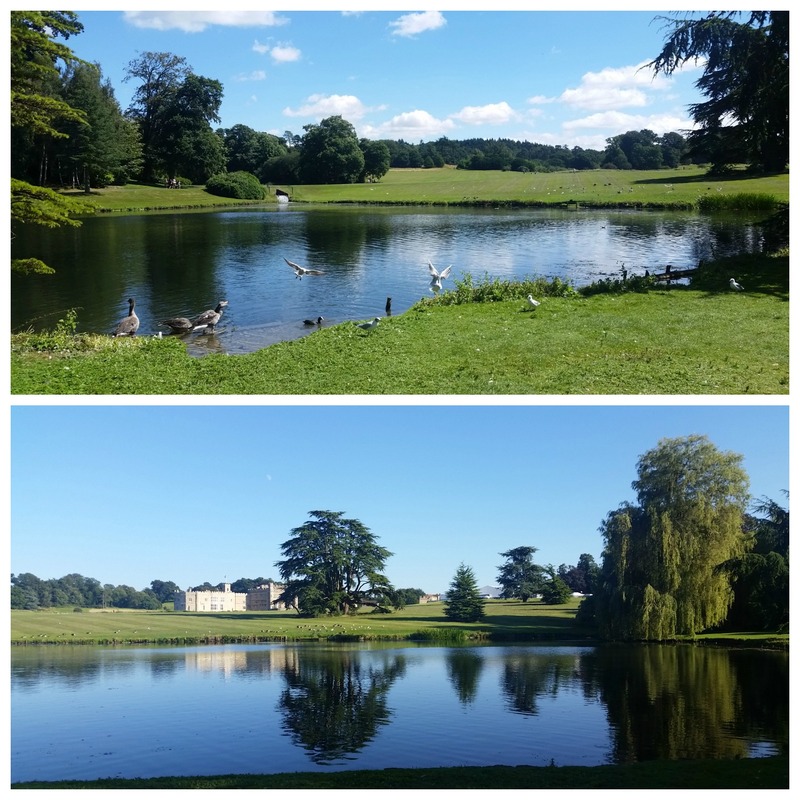 Thankfully, I had given up any claims to local trip planning already and was more than happy to go along with the plan for the next day, which involved a visit to nearby Leeds Castle in Kent and a very British plan to picnic on the rolling green lawns under the rare English sun. As it turns out, the California sunshine followed me to all but two days (both spent in Edinburgh) of my visit to the UK and Ireland, so I wasn’t complaining! One of the things I loved most about my visit to Europe is the pace of life there. We spent that entire day in sun-kissed bliss, strolling around the castle and meandering around the rolling green lawns and doing nothing in particular. It was such an unexpected change from the usual hubbub of invitations and surprise parties and planned outings that I couldn’t help but feel glad that I had decided to book an early August flight to the UK, despite all of my earlier reservations about spending my birthday abroad. Another lovely surprise that I hadn’t anticipated was the homemade Victoria Sponge Cake that arrived on the patio table after dinner that evening! A candle was already lit on top–I made a wish and blew it out, opened a card, and felt that little wriggle of happiness in my chest that only a really pleasant and unexpected surprise can inspire. By that time, the birthday wishes from back home were also flooding my way through social media and my (thankfully unlimited) international texting, and we spent the rest of the night in the forest-lined backyard, watching shooting stars from the Perseid Meteor Shower light up the starry black night sky. Though I’m certainly glad to be back home (in a place where things are familiar, my own baking supplies are present, and many missed faces are part of my daily life again! 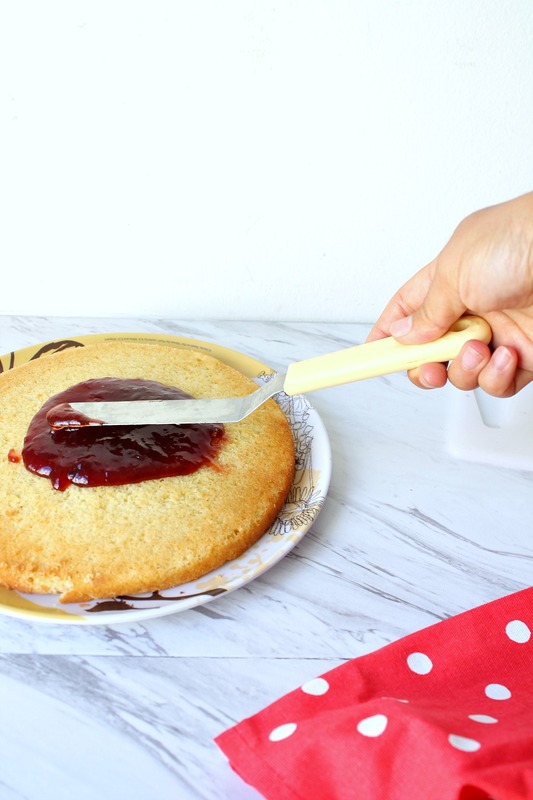 ), I couldn’t help looking up a few different recipes for Victoria Sponge Cake after I returned and started busying myself in the kitchen once more. 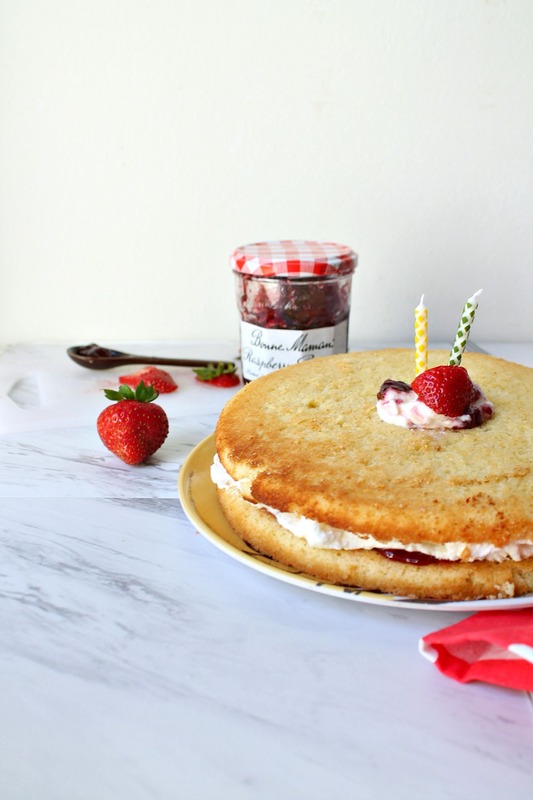 Named after Queen Victoria, this cake was birthday-perfect in so many ways: it was simple, made with freshly whipped cream and jam (fresh is so important in Europe), and quintessentially British in every way. 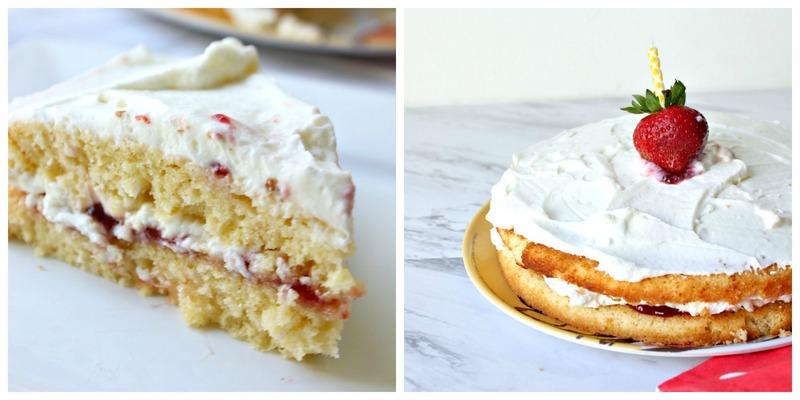 It’s also light, fluffy, and a cinch to make. 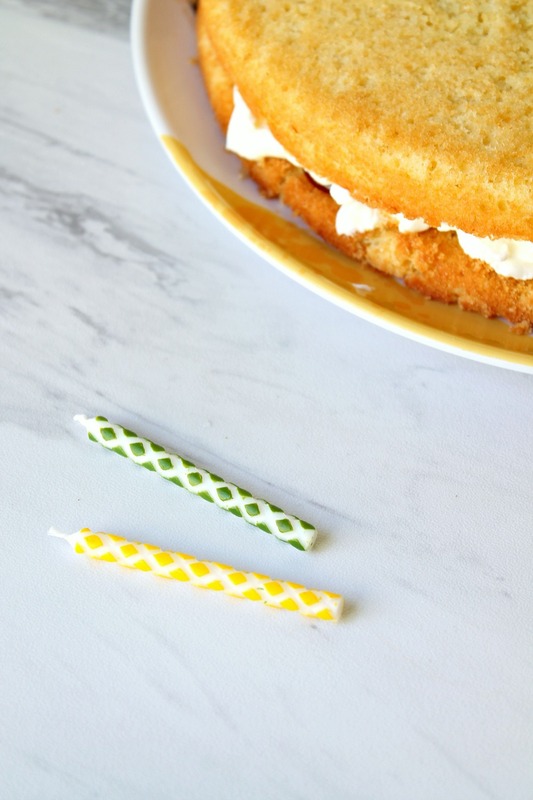 I couldn’t think of a better ode to the birthday I had spent in England than by recreating the surprise cake that I received, so here it is for all of you to read about and try as well! How do you usually celebrate your special day–with friends, family, cake? 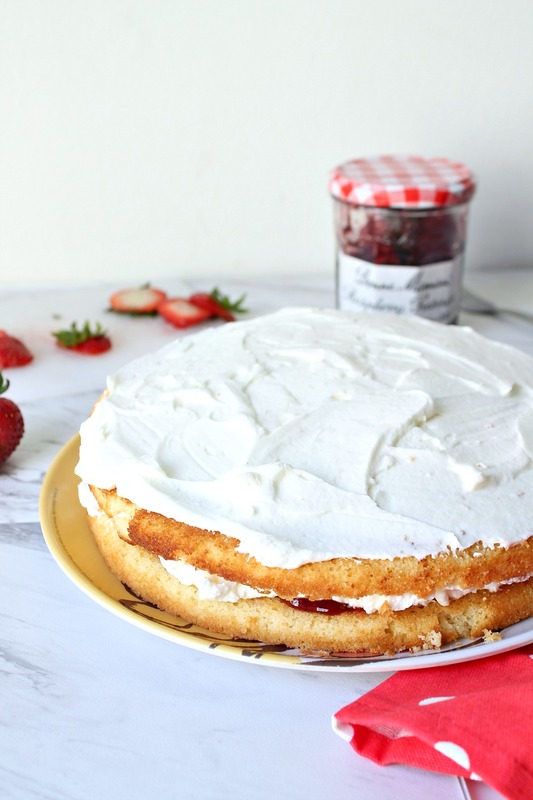 Named after Queen Victoria, this classic sponge cake is a quintessentially British treat and perfect for any special occasion. 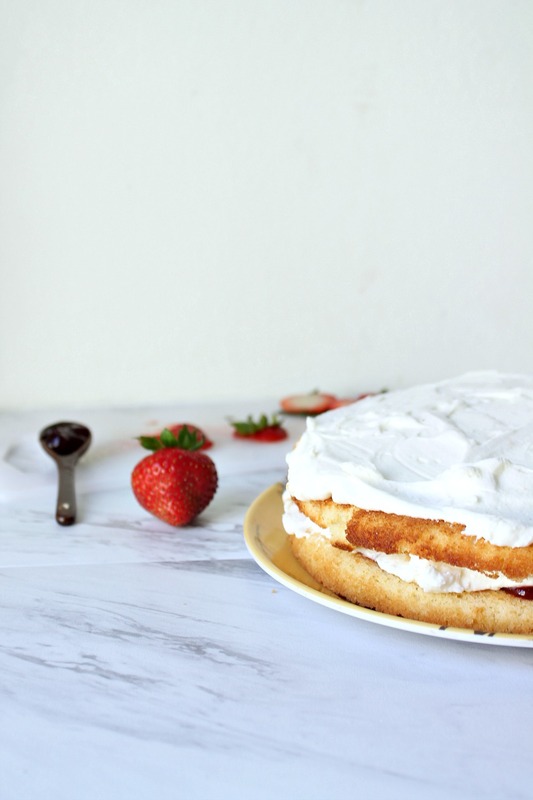 Its fresh jam, fruit, and whipped cream are the perfect complements for a light, fluffy, and absolutely simple two-layer cake. Slightly adapted from Tesco Recipes. 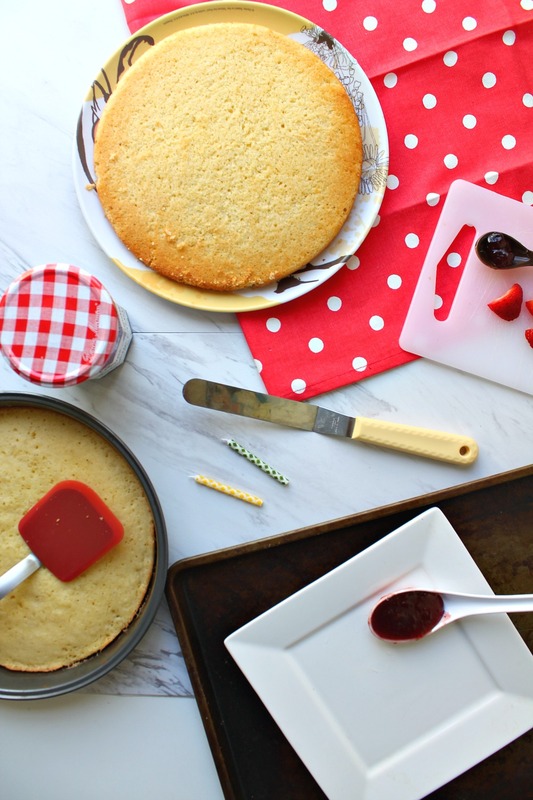 Preheat oven to 350 degrees F. Lightly grease two 9-inch round baking pans and set aside. In a large mixing bowl, cream together butter and white sugar until light and fluffy. Mix in eggs and vanilla. Gently fold in flour, baking powder, and salt until just incorporated. Divide batter evenly between the two prepared pans. on top. 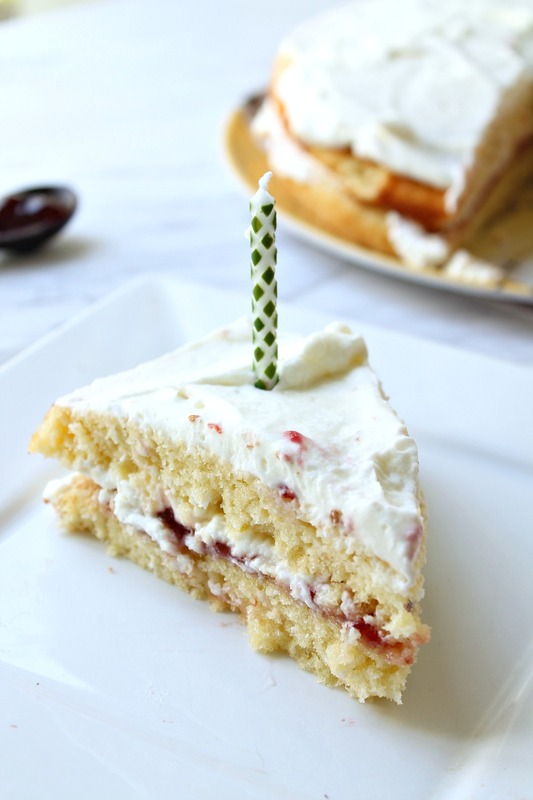 Carefully stack on second cake layer, then spread remaining whipped cream evenly on top. Garnish with sliced strawberries or other fruit if desired. Happy Birthday. Belated. 🙂 Sounds like a terrific way to celebrate your birthday. So, where will you be next year? 🙂 Terrific cake, BTW — thanks. Thanks for your email, John, otherwise I never would’ve caught this comment! Pesky spam filters 🙁 anyway, thanks so much for the birthday wishes–haha we shall see where next year takes me (somewhere equally exciting, I hope!). Cheers! 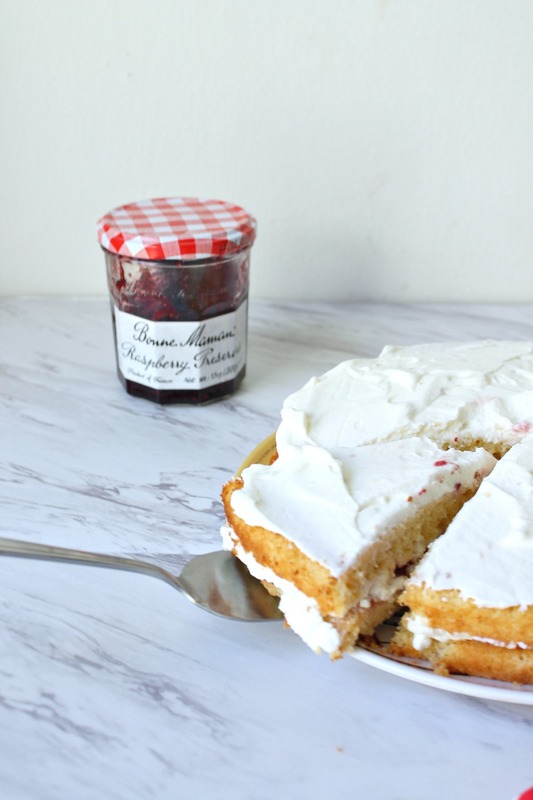 i’ve never had victoria sponge cake, but what’s not to love?! it sounds perfect for the days when i want cake, but don’t want to decorate something. glad you got inspired by your travels and that you got to recreate your bday at home! This Victorian Sponge is gorgeous! I love those alternating layers of tasty goodness there!